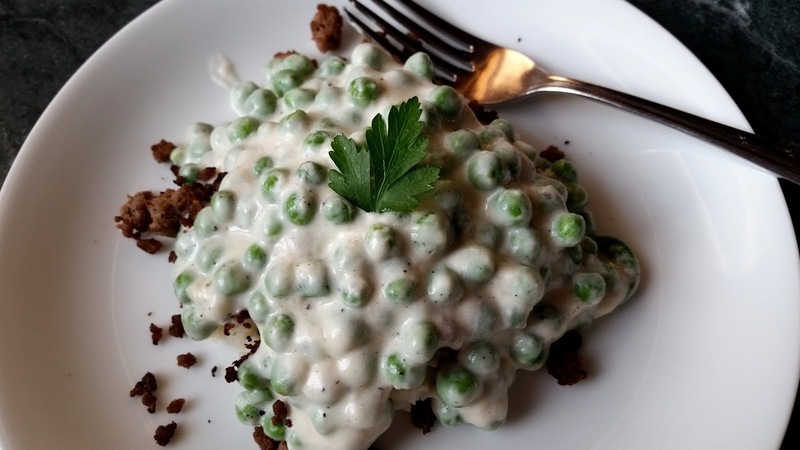 Creamed peas is a simple dish to make. Delicious served over mashed potatoes with plain fried ground beef or meatloaf. It is a great way to get your children to eat vegetables. Creamed carrots, green beans, or corn would be really good too. Melt butter, whisk in flour, salt, pepper, and dry mustard until smooth. Add cream slowly, stirring continuously until thickened. Pour over peas and it's ready to serve. 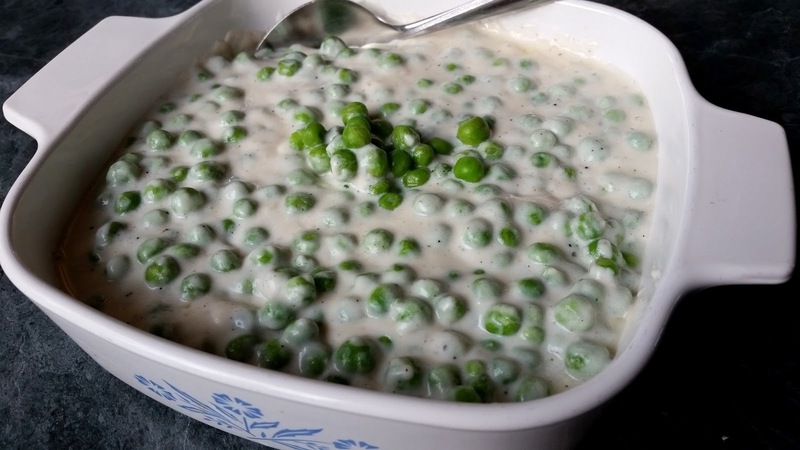 *I call this comfort food, I served it to my children when they were younger and when served like this they would eat all the peas and ask for more. First you put a bed of mashed potatoes on your plate, then fried ground beef and top with creamed peas. Enjoy! Betty, I used to make creamed peas all the time and have not had them for years...your idea of putting them on mashed potatoes and beef sounds yummy! Gee I haven't had them in a long time, My Mom use to make that. That looks so tasty. It reminds of something my mom would have cooked when I was a little girl. When my sister was a newly wed (45 years ago!) she made her husband's favorite dish of creamed peas and tuna on toast. It was a recipe of his mother's. I was horrified when I first heard of it, but it was absolutely delicious! Haven't had it in years, though. Have you ever made a recipe similar to that? I haven't made creamed peas with tuna on toast. Maybe mix the tuna into the creamed peas? Maybe others have made it and will comment here. I grew up with a Catholic mother and every Friday it was mac and cheese or Creamed tuna fish and peas on toast. I made it for my daughters all the time they loved it also. I could just eat it out of the sauce pan without the toast. It sounds like this is going back a generation or two for a lot of us. My mom used to make "pea gravy" and we put it on top of macaroni and she served it with smokies or farmer sausage. I loved it! I meant to add: I love your blog, look forward to it every day. Thank you so much for all that you share with us! My mother used to use chicken broth in place of the cream, and add some paprika. We ate it over chicken and mashed potatoes. I loved it! Mom always served creamed peas over salmon. If I was making it today (wish I was! ), I'd add a dash of lemon pepper to brighten it up a bit! We had creamed hard-boiled eggs over toast, creamed potatoes as a side dish... Thanks for the memories! I had creamed peas over salmon patties as well. It is a great combination. My mom always made this served over toast. Oh wow - this brings back the memories of my Mom's kitchen as well (including the corning ware dish). She often creamed the vegetables and especially the peas. Was always served with a nice splash of browned butter on top!!! Yum. My Mom used to make creamed Peas with Salmon Patties, Meatloaf and over top of toast or almost anything. Loved it as a kid. This is true comfort food and I had forgotten about them until I saw this post. Must be making some real soon. We eat creamed peas with salmon loaf and mashed potatoes. It's a winter dish, though . Oh yummy! This sure makes me miss home! The power of food and memories! A holiday tradition in our family is creamed peas and pearl onions eaten as a side dish with whatever else we're having. My mother also used to make creamed peas and tuna over toast or biscuits and I served that to our children when they were little. Now I avoid tuna due to the mercury content. My mother used to make this, we put it on toast. Mashed potatoes sounds better.